Open the corset and breathe freely! Away with bloodless chirping and that skinny, hollow sound! The “hoboist band” of the Californian “Toutes Suites” offers full, voluptuous life, as shown in the pictures of Rubens or Caravaggio. Figures like those from “Cyrano de Bergerac” appear on the musical stage prepared for us by the Thuringian composer Jean-Michel Muller. Baroque emotions which converse like genuine persons, introducing themselves to us and then making room for the next god, the next shepherd or the next satyr. It is incredible with what display of splendour, with what variety of colour such a “hoboist band” of just seven musicians can fly along… You, dear reader, don’t yet know who or what such a “band” is? Just buy the new GENUIN CD – you’ll find the answer and much more. Bur read before you switch on the CD player, because by then you’ll only want to revel in the music! 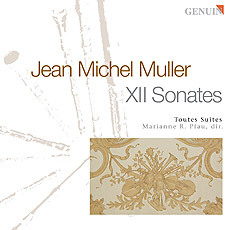 "Discovering Müller’s music here is a great treat: the ensemble “Toutes Suites”, under the direction of Marianne R. Pfau, offers us a lively interpretation of the highest quality that is served with impeccable technique." This recording was awarded the Spersonic of the Magazin Pizzicato. Read more here!